Rick Kelly scored a sensational and emotional victory for Nissan Motorsport/Kelly Racing in the first race of the Winton SuperSprint at Winton Motor Raceway, the sixth round of the 2018 Virgin Australian Supercars Championship. Kelly did that just a few days after Nissan announced it will withdraw support to Kelly family-owned team at the end of the season. Kelly Racing runs Nissans since 2013 and this was Rick Kelly’s first win with Altima. It’s also his first win since November 2011 when he triumphed at Sandown in a Holden. Kelly won a race ahead of Scott Pye (Walkinshaw Andretti United Holden) and Shane van Gisbergen (Red Bull Holden) after stealing a lead on the restart with eight laps to go. Prior to that, Scott McLaughlin (DJR Team Penske Ford) dominated a race from pole but he slid wide on the restart and dropped to P5, behind his teammate Fabian Coulthard. 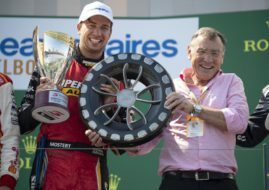 Nissan’s Michael Caruso ended up sixth, while Tim Slade, Garth Tander, James Courtney and Mark Winterbottom completed the top 10. After the 40-lap race on Saturday, one more 67-lap race at Winton is scheduled for Sunday.